Click the button below to add the Husky 30-Gal. Cast Iron Portable Electric Air Compressor to your wish list. The Husky 30-Gallon Portable Electric Air Compressor can deliver 3 - 6 SCFM at 90 PSI for a quiet airflow. 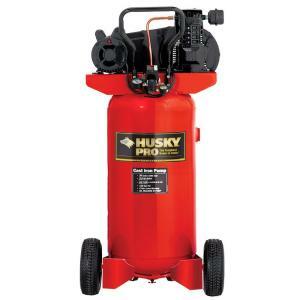 It features a cast-iron, twin-cylinder compressor pump for durability. The compact design with space-saving vertical tank helps make this unit great for garage and limited-space environments. It features tires, an intake filter, and a heavy-duty handle.